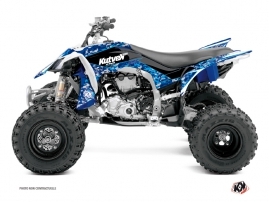 Kutvek Kit Graphik is an expert in creating ATV graphics kits. Since our beginnings in 2005, we have emphasized originality in order to offer you a wide range of ingenious stickers designed specially to decorate and protect your quad. 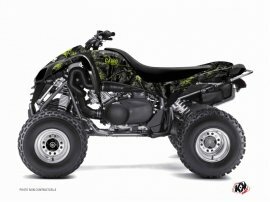 We can also provide you with the custom ATV graphics which will display your individuality in the best possible way. Just les us know about your colour preferences and send us visuals that inspire you, we will come back with the 100% personnalized draft ready for your approval. We manufacture our quad stickers with a patented material that ensures quality at every stage of the process. Your graphics kit comes with everything you need to highlight each component of your machine: front fenders, rear fenders, front panel, side panels and fuel tank (as well as additional parts for some models). • Unrivalled ease of installation. The glue we use on our stickers gives you a few minutes to reposition them. 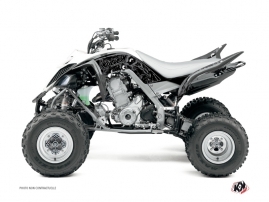 Once properly in place, applying heat ensures that the vinyl is perfectly molded to the contours of your ATV quad. • Colours preserve their intensity for a long time thanks to our printing machines and top quality materials. • Our decals are very resistant to the constraints associated with the use of your vehicle on all kinds of terrain. • The vinyl stickers provide reliable protection for ATV bodywork. We propose different collections of our products for the flagship brands of Quad ATV: Honda ATV, Polaris ATV, Yamaha ATV, Can Am quad, CF Moto, Kymco, TGB, Kawasaki, KTM. At Kutvek, you can order the unusual and innovative graphics kits for the most popular models of Quad 4x4 : Can Am Outlander 800, Can Am Outlander 1000, Can Am Renegade, Polaris Scrambler XP, Yamaha Grizzly 700, Suzuki Vinson 500, Honda Foreman. 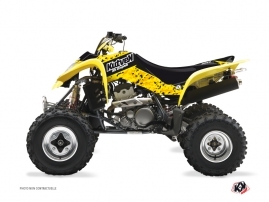 However, if you did not find an ATV graphics suitable for your vehicle, we can take templates for a particular model or any other body you can't find in our list. In this case you still have the choice between our ATV stickers of ready-made design or full custom ATV graphics kit for your four wheeler! Follow the example of the Riders and Teams of sport quad who trust us from 2005 : Jérémie WARNIA, Team By Rapport, Romain COUPRIE, Adrian MANGIEU, Matthieu TERNYNCK, Gregory LASSAIGNE, Clément JAY, Paul HOLMES.